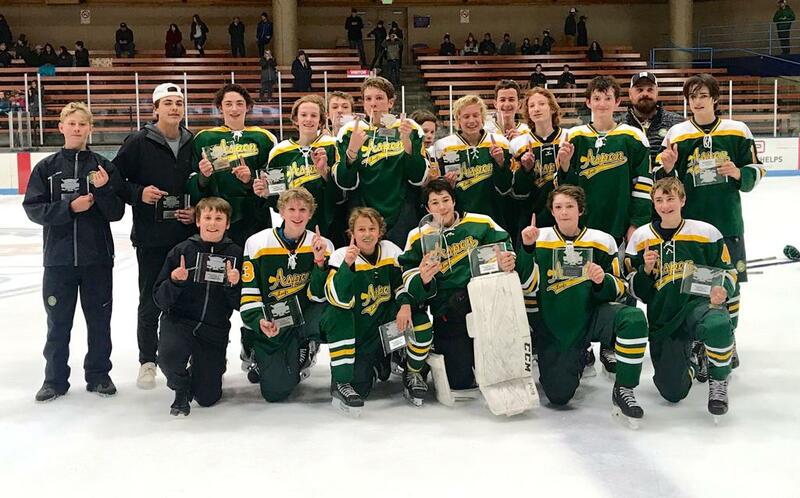 The Leafs Bantam A team finished the season in the WCHL championship game, losing a heartbreaker to the eventual state runner-up Summit Lightning. Aspen began the season claiming the Vail Sportsmanship Tournament championship with an impressive undefeated record. Facing roster setbacks throughout the season that included ongoing injuries and illness, the team came together at the end, showcasing to many a very talented and tough group. Fisher Scott led the team in scoring with 37 points (15 goals, 22 assists) in 21 games. First year players JJ Swenson finished the season strong in net recording a 2.75 goals against average in WCHL playoff action and Ryder Rondeau won the Daily Award. The Leafs Peewee A team finished the season in second place, both in the WCHL regular season and playoff tournament competition. Although the storybook finish was set up with a WCHL championship appearance, they were unable to crack the code on Vail. With a talented group of core players returning and a solid group moving up, there are high expectations for the 2019-20 Leafs Peewee A team. First-year player Jack Freitas led the team in scoring with 50 points (30 goals, 20 assists) in 40 games. Brecon Bridger, who graduates to Bantams, won the Daily Award. The Leafs Peewee B team showed signs of greatness throughout the season. In the three game round robin WCHL playoff championship tournament, Aspen just missed the cut with a formidable 0-1-2 record. Throughout the season, Aspen beat each of its WCHL opponents at least once. With a renewed effort for consistency next season coupled with some solid talent moving into Peewees, the future is bright for the Peewee B Leafs. Treven Ward, who moves to Bantams next season, led the team in scoring with 31 points (21 goals, 10 assists) in 35 games. Ty Vincent, who also moves to Bantams, won the Daily Award. The Leafs Squirt A team focused on following the scientific model of player development with a season plan of progressive skills acquisition. This methodical approach to training led to competitive success when it counted, as Aspen finished the season as the WCHL second place runner-up champion. The Leafs completed the regular season in third place before going unbeaten in playoff pool-play competition. Rupert Ingram led the team in scoring with 20 points (16 goals, 4 assists) in 33 games. Charlie Kaplinski, who (along with Axel Gleasman) scored five goals in the playoffs, was the Daily Award winner. The Leafs Squirt B team practiced with the Squirt A squad throughout the season, focusing on skill development and acquisition. A team of mostly first year players, the Leafs showed tremendous improvement throughout the season. Although their playoff hopes ended in double elimination defeat, the numerous successes the team experienced throughout the season were extremely impactful. First year player Rocco Garaffa led the team in scoring with 19 points (17 goals, 2 assists) in 23 games. Goaltender Drew Kuhlman was the Daily Award winner. 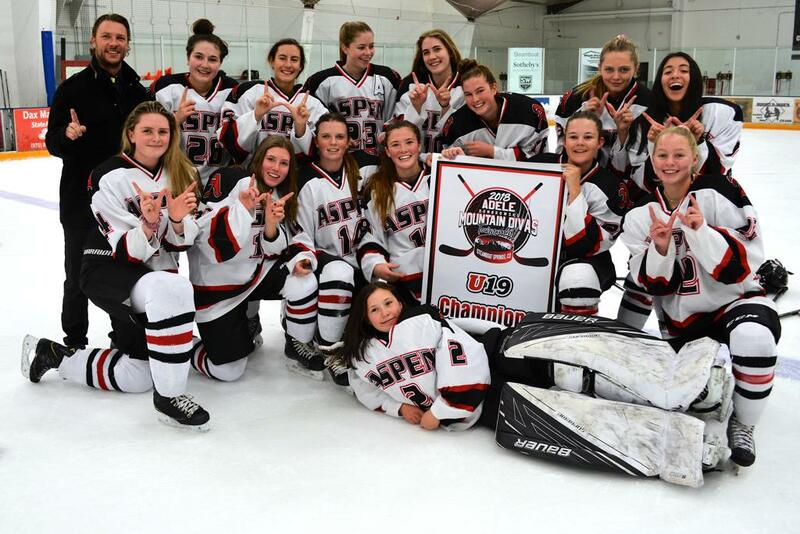 The Aspen 19U Girls team made history this season with a jaw dropping 26-0-1 overall record. 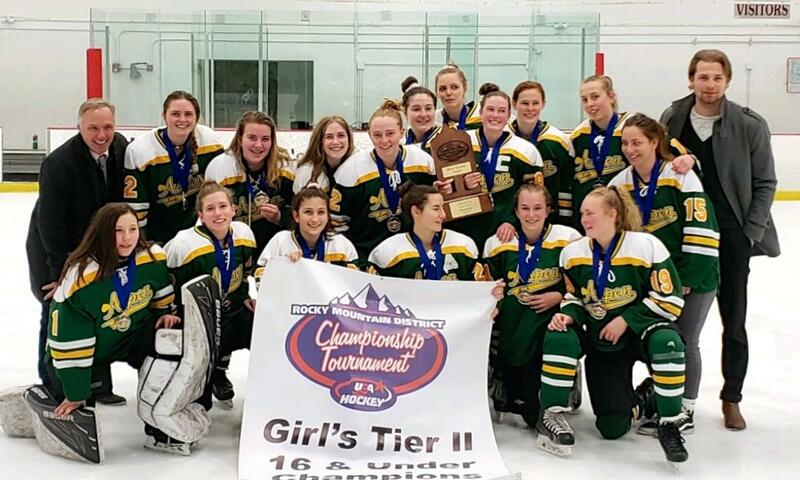 They finished the season with a State playoff championship, an MSGHL regular season championship, and the Steamboat Adele Dombrowski tournament championship. During the three championship title runs, Aspen outscored their opponents by a staggering margin of 125-19. Goaltender Sammie Jaworski led the league in save percentage and goals against average; Casey Chesner led the team in scoring with 32 points (15 goals, 17 assists) in 24 total games. Kaelin Harris was the Daily Award winner. 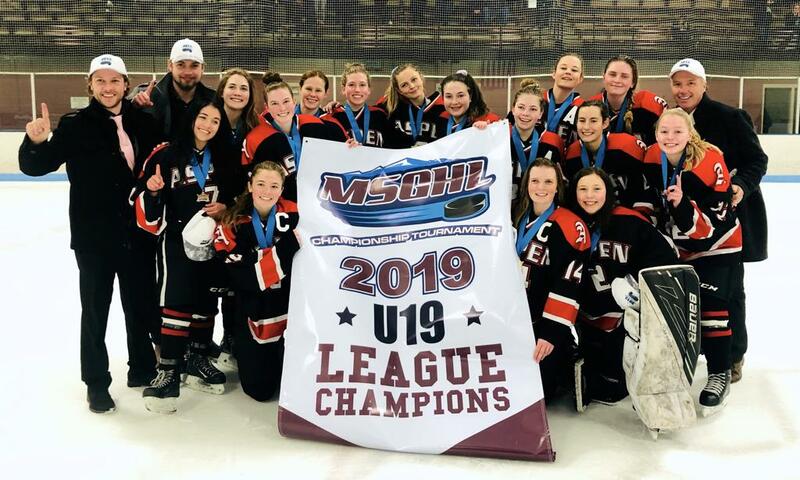 The Leafs 15U Girls had a formidable task this season, stopping an all-state team from New Mexico from cruising to an easy MSGHL championship. Finishing league play second behind undefeated New Mexico, Aspen prepared for the epic matchup in the MSGHL finals. After taking care of business with an undefeated pool play record, the Leafs fought hard to the bitter end in the championship matchup only to fall short of their season goal. The Leafs did experience a championship celebration in November, claiming the Steamboat Adele Dombrowski title with an undefeated four-game record. Casey Chesner led the team in overall season scoring with 26 points (21 goals, 5 assists) in 19 total games. Morgan Rightmire was the Daily Award winner. 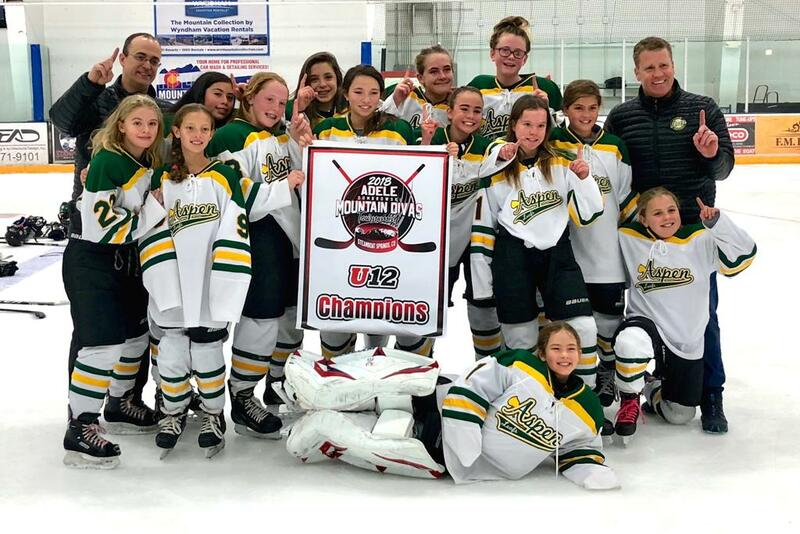 The Leafs 12U Girls team concluded the regular season with a second place 8-4 Mountain Division record, and a third place MSGHL State Playoff finish. During post-season play, Aspen fell short against the eventual champion Colorado Springs and runner up Salt Lake City. The two playoff game losses, after two wins against the Lady Roughriders and Colorado Select, ended the Leafs season after dreams of victory. 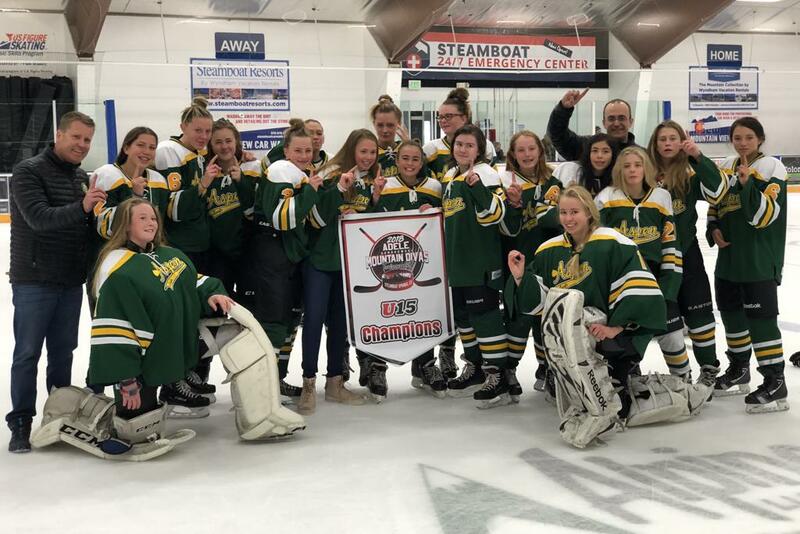 In November, the team celebrated the Steamboat Adele Dombrowski Tournament championship, outscoring their opponents 14-1 in four games. Kylani Nakagawa finshed the season as the team’s leading scorer with 25 points (21 goals, 4 assists) in 20 games. Clea Welden was the 12U Girls Daily Award winner. The 19U AA Leafs fell one game short of a USA Hockey National Championship appearance, dropping the District finals to Idaho, a team they had beat earlier in the tournament. As the team seemed to simply run out of gas, the success of the season shined over them brightly. 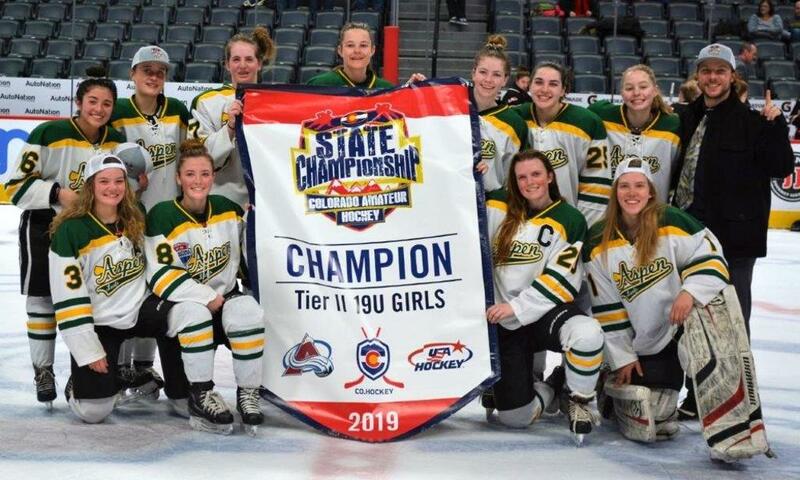 With a 9-2-1 season record, and games against the Mexican Women’s National team, Denver University, Colorado College, Team Colorado and more, the 19U AA Girls experienced a successful supplement to single A hockey. 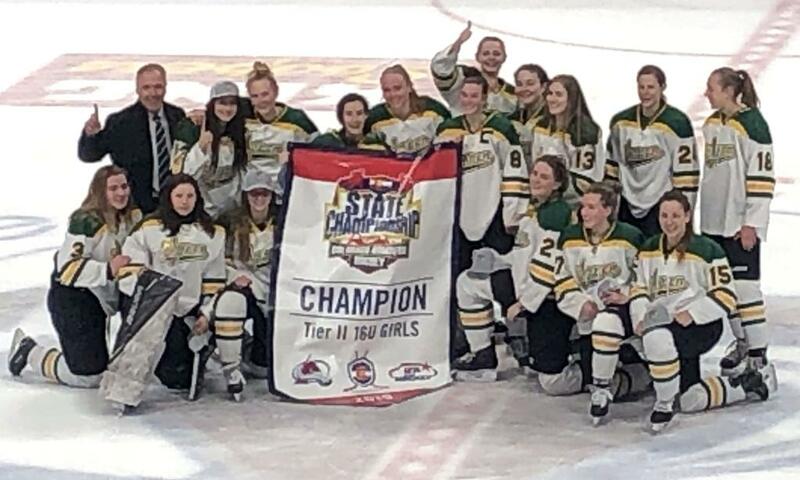 Defeating Littleton in the CAHA State Championship at the Pepsi Center was the highlight of the season. Senior captain Juna Rettig led the team in scoring with 24 points (16 goals, 8 assists) in 22 games. Katie Yocum won the Daily Award. For the second straight season, the Aspen Leafs 16U AA team represented the Rocky Mountain District at the USA Hockey National Tournament. This season, the Leafs were the only team to defeat the eventual national champions Vermont Shamrocks. Although not making it to the single elimination quarterfinal round was disappointing, Aspen can only celebrate another amazing season. Losing only one regular season game, the team beat the Lady Roughriders in both the State and District championship games. Gabby Demorat led the team in scoring with 31 points (20 goals, 11 assists) in 25 games; Laney Martens finished the season a close second with 30 points (17-13) in 29 games. Casey Chesner was the Daily Award winner. The Leafs 14UAA team was one of only four registered programs in the state and the Rocky Mountain District. A young team, Aspen hung with the limited competition all season, and turned some heads at the state championship tournament. With the core group returning next season, the Leafs are poised to make a run at another national tournament appearance. It was 2017 when the last Aspen 14U AA team advanced to the big stage in April. In 16 games played, Reilly Desmond led the team in scoring with 6 points (3 goals, 3 assists). Caroline Pekkala was the Daily Award winner. Congratulations to Kirk Golden, the 2019 Pete Whitmore Coach of the Year Award winner. Coach Golden led the 19U Girls A team to a historic 26-0-1 season, capping off the season with a MSGHL State playoff victory. He also led the 19U AA team to a state championship victory at the Pepsi Center. In the final playoff tournament of their season, he led his AA squad to the Rocky Mountain District Championship game only to fall short in a heartbreaking loss to Idaho. Coach Golden also gave countless hours of time in the role of player development coordinator teaching skills to players necessary for success. AJH hopes to expand his role serving our kids in 2019-20. In exemplary fashion, Tenille Folk led the largest program in AJH--the young Mites. Throughout the season she helped coordinate players and equipment for practices and jamborees. She organized coaches, travel plans, parties and more. Most importantly she served as the spokesperson and chief organizer for a large group new to youth hockey. Her efforts are instrumental towards our impassioned goal of 100% annual retention. The 2019 Jamboree was also one of the finest productions organized, receiving specific praise from City leadership. Her hard work and humility achieving success is inspirational and much appreciated.